Hobbies: Playing and watching football, playing video games and watching movies. 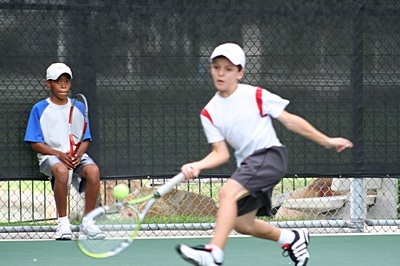 Jake De Vries, a Woodbridge, Irvine, resident and Woodbridge Tennis Club Junior Program member, zoomed up the Southern California junior rankings in 2006. Jake achieved a year end ranking in the 10's of 6, and has already climbed into the top 30 in the 12's in 2007 -- and it's only January! To find out more about the Woodbridge Tennis Club Junior Tennis Program, please click here! Copyright � 2005-2006. Expert-Tennis-Tips.com. All Rights Reserved.